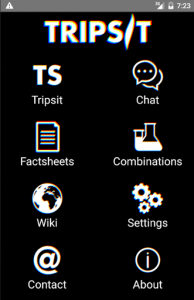 TripSit is pleased to announce the release of our free mobile app, which is now available on the Android Marketplace. 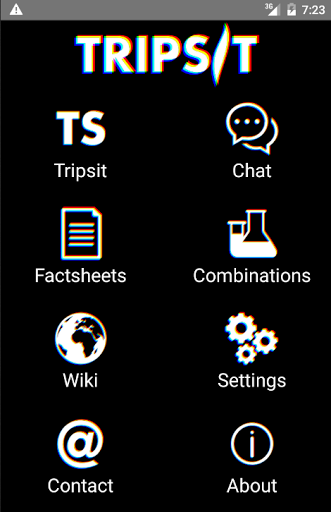 The TripSit mobile app connects mobile users with TripSit’s harm reduction resources through a handy and intuitive interface. TripSit collects relevant and easily digestible data on most recreational drugs, including dosage guidelines and interactions with other substances, and publishes it online for free use, while continuously reviewing it to make sure it is up to date with the most recent scientific and anecdotal research. Our app pulls data directly from our database, and provides users with an easy interface to access this information from a mobile device. Users can look up important drug information using our factsheets, search our Wiki, visualise drug combinations from our combo chart or connect to our live chat to receive help from the TripSit team directly. Please note that, as with all TripSit resources, the information is presented is for educational purposes only, and cannot include everything required to make informed decisions regarding drug use; all drugs affect every user differently. Dosage and combination data is provided as a general guideline, not as a recommendation and not as medical advice. If you believe you are in need of medical aid, then seek medical attention immediately. 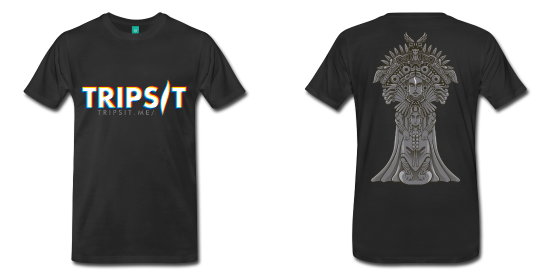 TripSit does not endorse drug use, and while our team makes a best effort to provide accurate information, we do not claim that it is 100% correct. Always do your research and be safe. Just downloaded the Tripsit mobile app. It is more easy to read the site in app as compared to reading it in my browser. Good job!